Everyone has heard and read of Tuscany and renting a villa there has almost become a cliché. But there is much more to the region, as my daughter and I found when we visited Italy in spring. Bordering Tuscany in Central Italy, Viterbo is in the province of Lazio; it has a population of 70,000 and this walled city has everything the tourist or local could want. Unlike Siena, 300 kilometres away, Viterbo has not long been in the tourist headlines, but don’t deny yourself the delight of discovering this fascinating city at the base of Monte Cimino. Situated between Florence and Rome, Viterbo is custodian to a host of architectural and artistic treasures. The lion, symbol of the city, adorns the facades of palaces and churches and the spindle fountain, a typical element of Viterbesian craftsmanship, can be seen at almost every turn. So many remains of the past are to be found in the environs of the city, particularly in the medieval district of San Pellegrino. This most absorbing area preserves, virtually intact, the ancient dwellings and alleyways of the past; the almost severe simplicity takes the traveller to a former era where one can really shut out the wider world. The houses, stairways and pavements are all built from the volcanic rock of the region, displaying different shades of grey and imparting a sense of integrated elegance – nothing modern or garish here and certainly no signs or advertising! Balconies full of flowers, cuneiform arches and profferli (external stairs leading to an arched balcony) are features of this fascinating place. The myriad paved walkways twist and turn, taking the visitor through narrow lanes which open on to small piazzas and tiny old gardens where local residents smilingly pass the time of day. Stopping for coffee in one of the small shops, a fellow customer offered us fresh plums – such is the friendliness of the inhabitants of these less well known towns. The medieval quarter is also home to intimate restaurants, antique shops and artists’ workshops, where wood-workers, gilders and stonemasons are consummate craftsmen. In one wood-carver’s studio there is an entire schoolroom, complete with children sitting at desks! There are few mass-produced artefacts in San Pellegrino and the arts are nurtured precisely, restoring and refining in accordance with centuries-old traditions. Formerly an Etruscan area and a home of Pope Clement 1V, the early history of Viterbo, like that of every medieval city, was characterised by furious and bloody wars, hence the high and strong walls. At the same time, an underground maze of tunnels formed a secret road system which became the main way of access and escape. They connected the most important places of the city as well as affording a route to the outside walls. Many of the tunnels were later widened into cellars and galleries and during the Second World War they were used as air-raid shelters. Some of them are still accessible today, down small stairways dug into the stone; however, most of the passages have been walled up. Close to Viterbo is Lake Bonsena, on which is situated the town of Montefiasconi. Nestled amongst rows and rows of vines, the famous Est! Est!! Est!!! is produced here. Close by is Lake Vico and the little village of Ronciglioni, where we came across lively old ladies peeling vegetables and keeping an eye on their grandchildren in a tiny Piazza. The quaint town of Bagnoregio, clinging to a clay spur on a cliff-top, is a short bus ride from Viterbo. This amazing link to the past can be accessed only by footbridge. Limestone cliffs, Etruscan tombs and the ruins of a Roman theatre at Ferento are also within easy reach of this ancient centre. When you are tired of walking, relax in the 16th Century Villa Lanti gardens at Bagnaia, or experience the hot springs in the territory around Viterbo. They are known for their therapeutic qualities and rate a mention in Dante’s ‘Inferno’. Donning our walking shoes one morning, we walked around the outside of the Viterbesian walls and climbed the lower slopes of Monte Cimino. Eventually leaving the road, we turned down a grassy lane and came out on a field of spring wildflowers. The view and the smells were indescribable – the sky was blue, there was not a sound to be heard, and in the distance were old farmhouses with the walled city in the far background. We had with us the remains of the previous night’s pizza and some fruit, after which we lay down in the grass and the rest of the world ceased to exist. Later, having found a shortcut back to Viterbo, we entered the walls via Porta Romana and stopped for one of Italy’s famous gelatoes, finally arriving back at our hotel footsore, weary and covered in grass stains. But what a way to spend a day! It is satisfying managing the odd phrase or question in Italian and being understood, though being over-confident can have its drawbacks. My daughter was invited to go swimming with some locals and I nodded and smiled as she declined, explaining that she only swims when it’s very hot; what she in fact said was: ‘I only go swimming when I’m on heat’. One day a passer-by asked me directions and I thought I was answering that ‘it is only five minutes away on foot’. I wondered why she scuttled away – I later realised that I had told her I have five feet! As in most of Italy, there are plenty of eating places to choose from, both in and near Viterbo. One of the most memorable for me was in the little town of Soriano nel Cimino, a short taxi ride away. The driver obligingly stopped en route in order for us to photograph the town from a distance; it looked magical in the evening light. 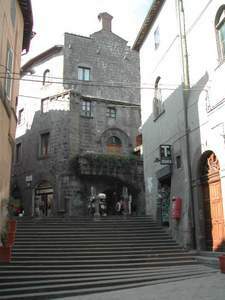 Accommodation to suit all tastes and budgets is available in Viterbo – we chose a modest hotel which was clean and inexpensive. It carried a three-star rating and cost the equivalent of 90 Australian dollars twin-share per person per night. Viterbo and the surrounding villages are not-to-be-missed towns of this part of Italy. Be adventurous and make your own arrangements rather than going on a tour; you will come home feeling as though you have really experienced travel, rather than leaving it to the tourist agent.